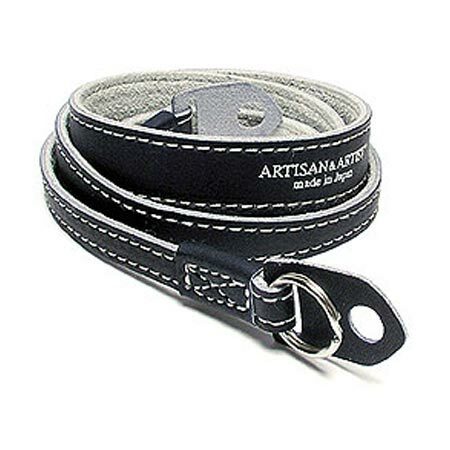 By popular demand, Artisan & Artist* have created a slick sequel to their popular tapered strap. This strap is made of the same soft leather and it has an enhanced grey suede underside to go with its sharp navy top deck, however it also is far more stylish with pronounced white stitching that brings to mind a WWI pilot's harness. This is the perfect strap to use with a special edition Leica or a chrome body which highlights the fine thread work executed on all the seams. At the medium length the White Stitch Strap allows the camera to hang at chest height comfortably and secures the camera from swinging too low or into harms way. As seen on all Artisan & Artist* straps, special top plate protectors keep the steel rings from coming in contact with the cosmetics of the camera while making a sure-fit with the camera lugs with plenty of room to pivot as needed. You won't find yourself ever tangled in the White Stitch Strap!